The physical environment provides continuous and usually unambiguous feedback to the learner who is trying to learn physical operations, but does not respond to the learning attempts for cognitive operations. Engelmann, Siegfried; Carnine, Douglas. Theory of Instruction: Principles and Applications (Kindle Locations 1319-1320). NIFDI Press. Kindle Edition. Into The Dustbin Of Pedagogy? I wholeheartedly concur with her last statement, but must confess that I find it hard to articulate why I feel practical science is such a vital component of science education. The research base in favour of practical science is not as clear cut as one would wish, as Helen points out in her blog. [T]his then raises the question of “what about the kids who are never going to see a pipette dropper again once they’ve left school?” I don’t have a great answer to that. Even though all knowledge is valuable, it comes with an opportunity cost. The time I spend inculcating knowledge of pipette droppers is time I am not spending consolidating knowledge of the conservation of matter or evolution or any other “Big Idea.” [ . . . ] But if you’ve thought about those things, and you and your department conclude that we do need to teach students how to use a balance or clamp stand or Bunsen burner, then there is no other way to do it – bring out the practical! Not because anyone told you to, but because it is the right thing for your students. Broadly positive, yes. But am I alone in wishing for a firmer foundation on which to base the plaintive mewling of every single science department in the country, as they argue for a major (or growing) share of ever-shrinking resources? 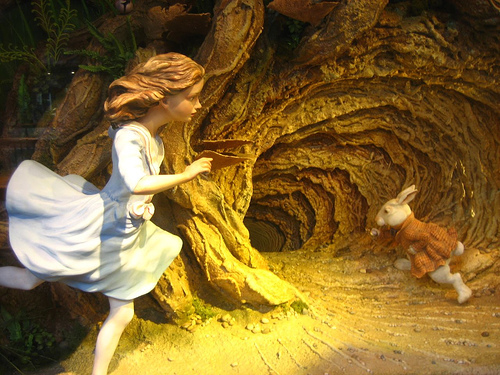 I think a more substantive case can indeed be made, but it may depend on the recognition that we, as a community of science teachers and education professionals, have gone down the wrong rabbit hole. By that, I think that we have all drunk too deep of the “formal investigation” well, especially at KS3 and earlier. All too often, the hands-on practical aspect plays second- or even third- or fourth-fiddle to the abstract formalism of manipulating variables and the vacuous “evaluation” of data sets too small for sound statistical processing. So, Which Is The Right Rabbit Hole? The key to doing science practicals “better” is, I think, to see them as opportunities for students to get clear and unambiguous feedback about cognitive operations from the physical environment. To build adequate communications, we design operations or routines that do what the physical operations do. The test of a routine’s adequacy is this: Can any observed outcome be totally explained in terms of the overt behaviours the learner produces? If the answer is “Yes,” the cognitive routine is designed so that adequate feedback is possible. To design the routine in this way, however, we must convert thinking into doing. Engelmann, Siegfried; Carnine, Douglas. Theory of Instruction: Principles and Applications (Kindle Locations 1349-1352). NIFDI Press. Kindle Edition. Challenge students to identify the angle of incidence as the independent variable and the angle of reflection as the dependent variable. Explain what the “normal line” is and how all angles must be measured with reference to it. Get out the rayboxes and protractors. Students carry out the practical and record their results in a table. Students draw a graph of their results. All agree that the straight line graph produced provides definitive evidence that the angle of reflection always equals the angle of incidence, within the limits of experimental error. I’m sure that practising science teachers will agree that Stage 5 is hopelessly optimistic at both KS3 and KS4 (and even at KS5, I’m sorry to say!). There will be groups who (a) cannot read a protractor; (b) have used the normal line as a reference for measuring one angle but the surface of the mirror as a reference for the other; and (c) every possible variation of the above. The point, however, is that this procedure has not allowed clear and unambiguous feedback on a cognitive operation ( i = r) from the physical environment. In fact, in our attempt to be rigorous using the “formal-investigation-paradigm” we have diluted the feedback from the physical environment. I think that some of our current practice dilutes real-world feedback down to homeopathic levels. Sadly, I believe that some students will be more rather than less confused after carrying out this practical. How might Engelmann handle this? Initially, the mirror is covered. The challenge is to figure out where to stand in order to see the reflection of an object. If the routine is designed so the learner must take certain steps and figure out the answer before receiving verification of the answer, the routine works like a physical operation. The outcome depends on the successful performance of certain steps. Engelmann, Siegfried; Carnine, Douglas. Theory of Instruction: Principles and Applications (Kindle Locations 8699-8709). NIFDI Press. Kindle Edition. Do I want to abandon all science investigations? Of course not: they have their place, especially for older students at GCSE and A-level. But I would suggest that designing practical activities in such a way that more of them use the physical environment to provide clear and unambiguous feedback on cognitive ideas is a useful maxim for science teachers. Of course, it is easier to say than to do. But it is something I intend to work on. I hope that some of my science teaching colleagues might be persuaded to do likewise. A ten-million year program in which your planet Earth and its people formed the matrix of an organic computer. I gather that the mice did arrange for you humans to conduct some primitively staged experiments on them just to check how much you’d really learned, to give you the odd prod in the right direction, you know the sort of thing: suddenly running down the maze the wrong way; eating the wrong bit of cheese; or suddenly dropping dead of myxomatosis. ​The fact narrated must correspond to something in me to be credible or intelligible. We as we read must become Greeks, Romans, Turks, priest and king, martyr and executioner, must fasten these images to some reality in our secret experience, or we shall learn nothing rightly. But even when it seems like it’s all over, it’s still not over. The heavy hand of collective-responsibility roulette has tapped me on the shoulder. It’s my turn to write the scheme of work and resources for the next term. I am to write the energy module for the new GCSE Science course. And it must be done, dusted and finished over the Christmas break. The Christmas break. And the surprising and unexpected truth is . . . I actually think I’m going to like doing it! Yes, really. Strange to say, I have always enjoyed writing schemes of work. To my mind, it’s a bit like fantasy teaching instead of fantasy football. I move lesson objectives and resources hither and thither where others shift premier league strikers and goalkeepers. Some aspects of the Science curriculum are abtruse and hard to communicate. Undoubtedly, some of the things we narrate do not always correspond closely enough to something which is already in students to be either credible or intelligible to them. The images and concepts must be fastened to some reality in their “secret experience” for them to learn rightly. And what can we do to help them? Simply this: make sure that students get as much hands-on practical work as possible. Of course, it goes without saying (I hope!) that it should go hand-in-glove with coherent and thorough explanations of the theoretical underpinnings of scientific understanding. Let us hope that our students (in the words of R. A. Lafferty) never see a bird fly by without hearing the stuff gurgling in its stomach. ​But it must be remembered, that life consists not of a series of illustrious actions, or elegant enjoyments; the greater part of our time passes in compliance with necessities, in the performance of daily duties, in the removal of small inconveniences, in the procurement of petty pleasures; and we are well or ill at ease, as the main stream of life glides on smoothly, or is ruffled by small obstacles and frequent interruption. Another day, another drachma. (Teachers aren’t paid enough for it to be counted in dollars.) And a new school! Yes, notwithstanding the fact that I am generally a supine and procrastinating creature of habit, I finally decided to take a plunge and move school. For a number of reasons, the grass looked decidedly greener elsewhere. And although it’s more a cheeky little sidestep than a promotion, so far I would say that it still “feels” right. So I am now deep into the business of establishing myself in a brand new school. It makes you realise how much we all depend on the unwritten and unspoken rules and expectations that are grist to the mill of every workplace. But these seem writ especially (but invisibly) large in schools, or so it seems to me. So my working life now is emphatically not a series of illustrious actions, or elegant enjoyments. Rather, it is the bread and butter of teaching: turn up; do thou thy daily duties; attempt to remove or smooth over the inconveniences of life; work to establish relationships; and procure a few petty pleasures for yourself, your colleagues, and your students. My new school has some excellent policies and procedures. And, of course, some batshit crazy ones too. Some of them make you think that the MAT it belongs to has never read the “Ofsted Mythbusters” page. On the plus side, the Science department has developed a system that makes triple marking almost work. I have made some other changes too. Although I’ve been working long hours, I have not installed my school email on my phone or my tablet: when I am at home I intend to be at home, without the insatiable monster of work email rearing its ugly, insistent head and colonising my every waking thought — and, sometimes, even my dreams. And so the main stream of life glides smoothly onwards. So far, at least. Long may it continue.